I woke up at 8 am this morning, lazed in bed reading, got up to eat breakfast and then found myself back on my bed petting a cat. One thing led to another and suddenly I was back under my covers. I finished one book and started another, enjoying the warmth of being sandwiched between two sleeping cats. As I lay there, every so often I would think to myself, “You really should get up…” but I really didn’t want to . I passed several hours this way, enjoying it while another part of myself berated my laziness. An ongoing fight I have with myself whenever I relax when I “could” be working. I’m always afraid if I give in to my impulses I might never get out of bed again. An object at rest stays at rest, etc. I always forget I am not some kind of perpetual motion machine, and that sometimes humans need downtime in order to be productive, especially after teaching 11 hoop classes in two days (I taught my first kids workshops and they were fantastic, but exhausting). I’ve been working on releasing guilt about taking down time for myself, but like all things, it’s a work in progress. The thing is though, after a couple hours of serious chillaxing, I got up, got dressed and went for a run. After this post, I plan on taking a yoga class, doing dishes, making lunch and setting off to my afternoon appointments. Being lazy for a couple hours set me up to be far more joyfully productive for the rest of the day, rather than dragging myself through my obligations. It always does, and I have never really gotten ‘stuck’ on lazy (not for more than a day or two). Why do I continue to resist, when I know it’s all just part of the natural cycle of my energy flow? Lessons surrounding this resistance keep coming up for me. A few days ago, Danielle Laport wrote an amazing piece on what happens to you after a breakthrough (You shrink after you expand, but don’t worry, not all the way back to baseline). The main takeaway for me was to be gentle with myself after doing something major. A little downtime is required and perfectly appropriate. 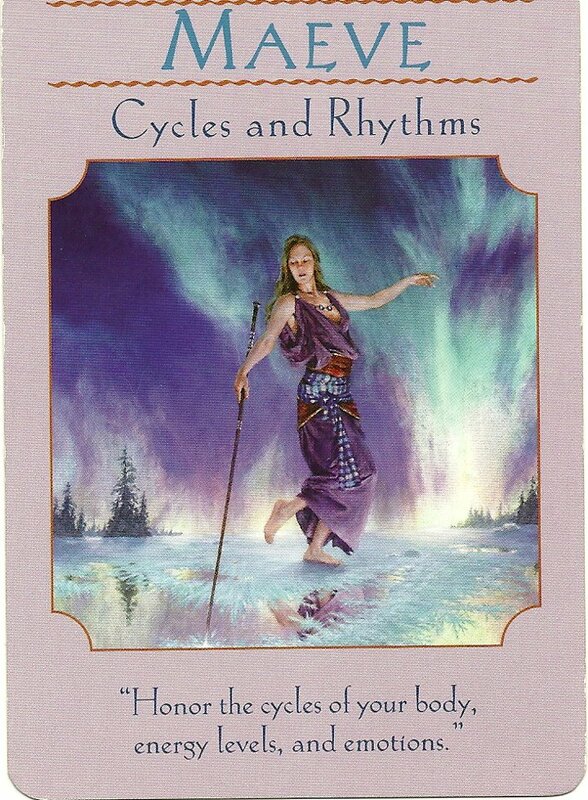 The Celtic Goddess who asks us to honor our cycles and rhythms. She reminds us that there is a cycle to all of creation, even to the sun, the moon and the stars. Why should we be worried or upset when we have the cycles of energy as well. She asks us to honor them, and understand they are a sacred part of our experience. I’m trying, Maeve, I really am. Riding the waves, and enjoying the highs, and allowing myself to accept and even embrace and enjoy the lows as well. Snuggling with kitties and reading is a whole lot more enjoyable when I admit that it’s just as important and productive as anything else I could be doing. RnR is an essential part of life. I am so grateful to have had the time to do some of my favorite things, finding balance between work and rest, expansion and contraction, and allowing time to integrate all of the awesome. What’s your favorite way of resting, relaxing and renewing yourself? Do you ever feel guilty about it? If so, stop it! Stop it right now, and let’s relax together so we have enough steam to light up the world and do all the things! May is here, and it finally, legitimately, feels like winter is truly behind us (of course it just might snow once more on May long weekend, to the chagrin of campers out for the first time of the season). 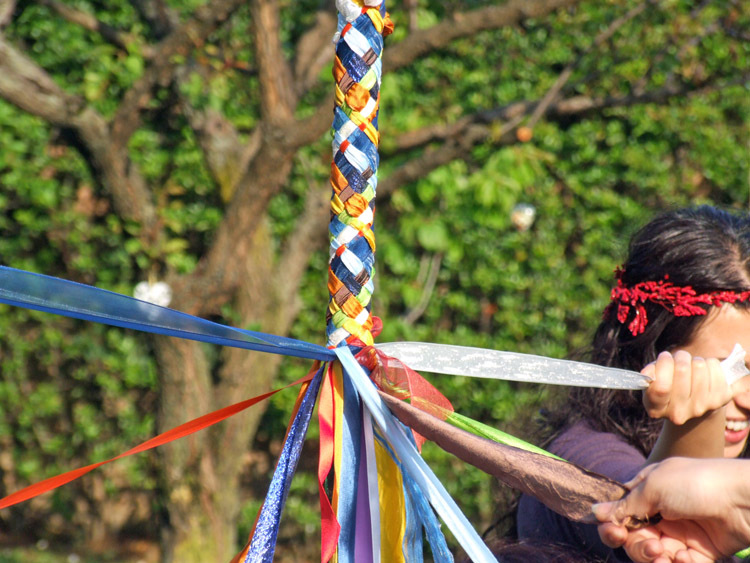 With May comes Beltane, the fertility festival halfway between the Spring Equinox and Summer Solstice! This is the time when the Sun and Earth, God and Goddess unite in a sacred dance that creates life. The joint forces of the masculine and feminine principles are the fuel for all of creation. This is where the tradition of the Maypole comes from, by the way. Often celebrated May 1st, this year, the exact astrological point of Beltane is May 6th. My elemental mentor Lisa Michaels details more about Beltane on her blog here, including how you can use these energies to fuel your creations. This is a great time to check in with the intentions you planted during the winter solstice, and you can use the fiery, grounded energy of this time to fuel them. A perfect way to honor the marriage of Earth, the physical realm and Fire, the action realm is to dance. To be action embodied, in celebration of life itself. This year, to celebrate, I danced wearing as many flowers as I could to represent the blossoming season. Yes, my flowery plants were falling down, but I was having too much fun to stop. How will you be celebrating the start of our summer growing season and the sacred marriage of the divine masculine and feminine?